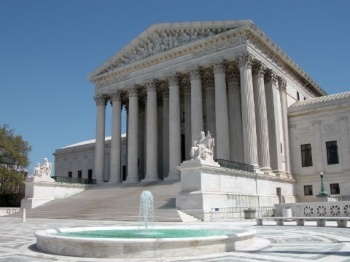 The legal fate of the gaming industry could be decided at the beginning of next week. More than half a year ago, the Supreme Court of the United States (SCOTUS) heard arguments in "Schwarzenegger v. EMA," a case that would decide once and for all whether games had the same rights under the US Constitution as other media like movies, music and books. According to the ECA's Hal Halpin (via Twitter), the court is expected to give its verdict on this coming Monday. The case has been referred to as gaming's "single most important challenge" in this country, as a SCOTUS ruling in the favor of the state of California could spur states from the Pacific to the Atlantic to enact anti-game laws of their own. Though initial impressions from observers were positive, it's worth noting that the Schwarzenegger case is the only case from that Supreme Court session that has not yet been decided. This could be because it's more hotly debated than the others, or it could be because one of the justices is taking his or her sweet time in writing what could be a landmark decision. Fingers crossed, everyone. We all know that gaming should have all the rights to free speech as any other medium, and let's hope that the Supreme Court recognizes that as well.